When I first started teaching the skill of visual note-taking, I broke down the applications of sketchnoting into three categories: learning, solving problems, and sharing ideas. I still like those three categories and feel like that breakdown is all-encompassing, but lately I’ve been shifting the way that I phrase the last one. I’ve been moving from “sharing ideas” to “telling stories”. 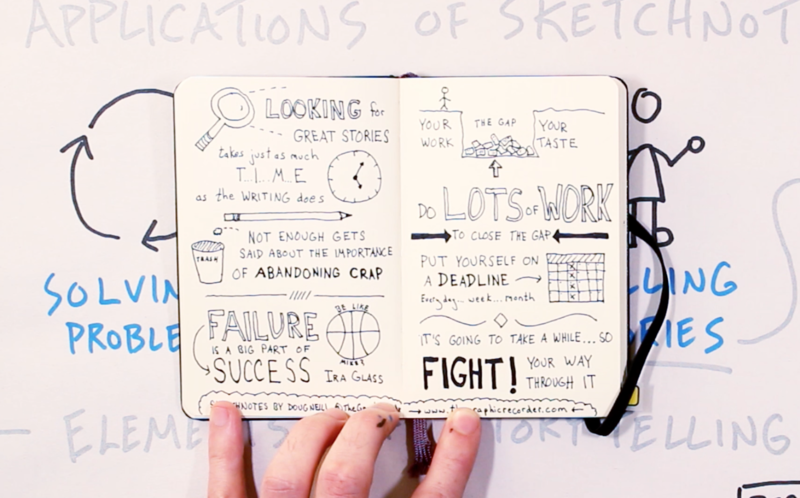 Let’s explore the reasons underlying that shift, and dig a bit deeper into how you might do a better job of using your sketchnotes as a storytelling tool. I think the term “sharing ideas” is a little too abstract and a little too boring. When you instead choose to craft a set of ideas into a story, you’re making it easier for the listener or viewer to wrap their head around whatever it is that you’re wanting to share. Stories are more interesting, more memorable, and more actionable than isolated ideas. 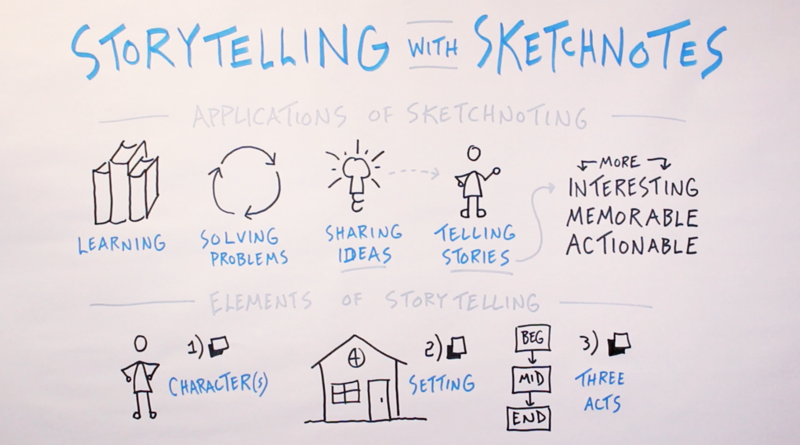 With that as the general premise here, let’s look next at the basic elements of storytelling so that you can start to look for opportunities to weave those elements into your sketchnotes. I’d like to highlight just three elements. First of all, a story needs a character, at least one. We can use simple stick figures or slightly more detailed drawings of people or other animals or any object that you want to place at the center of your story. Next, you need a setting. Where does that character live? Where is the action taking place? For this element, a simple scene will do – maybe just a ground level line and a building to show we’re at home. Finally, there needs to be a beginning, a middle, and an end to your story – a three act structure that you’re likely already familiar with. In many cases you can allude to a three act structure with just a single sketchnoted image. 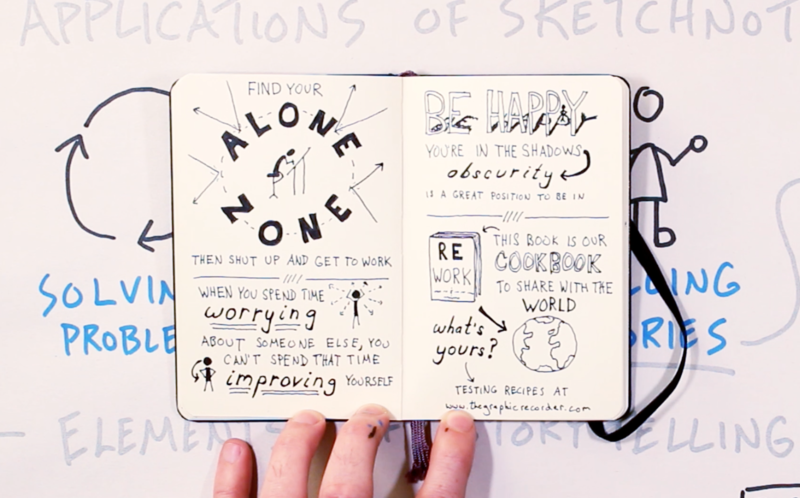 Let’s take a look at some examples to get a better feel for how you might incorporate these elements into your sketchnotes. 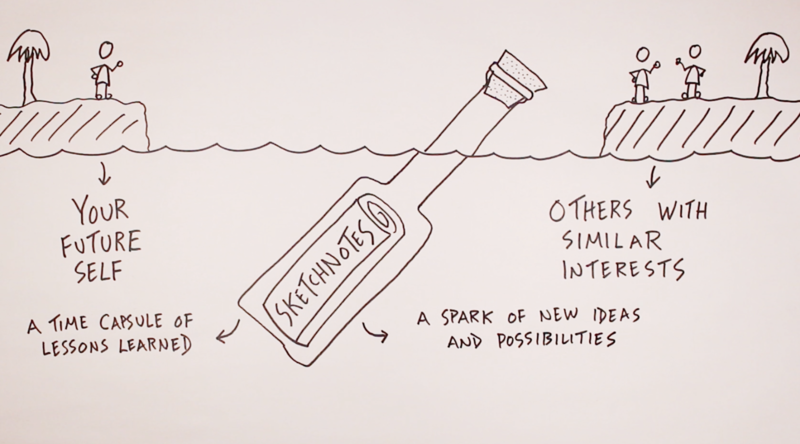 Let’s start with the most recent video that I uploaded, which explored how sketchnotes are like a message in a bottle. In that case the setting is made clear first, with the analogy of sketchnotes rolled up and corked inside a bottle that’s tossed out into the sea. From there we see the characters – you, the creator of those sketchnotes, and others who might stumble upon them in the future. The beginning of this story is mentioned in the audio but alluded to in the image – you taking the sketchnotes. The middle is what we see now – the notes and the ideas within them floating around, waiting for their next stage of life. And the end is left open to the imagination – it lives in the potential impact that those notes will have, on one of the characters that we’ve established. So there’s an anticipatory and hopeful uncertainty to this story, and it didn’t take much imagery to convey it. The same goes for another video I made a while back, this one short and sweet, depicting a quote from Annie Dillard’s book The Writing Life. Here I would describe the character as us, the viewer, looking at this clock, which makes the setting wherever it is that you spend most of your time each day, where you are when you most frequently check the time. We see time progress as the hands of the clock move – beginning at the start of the day, moving though the middle of it, and ultimately coming to the end of it. 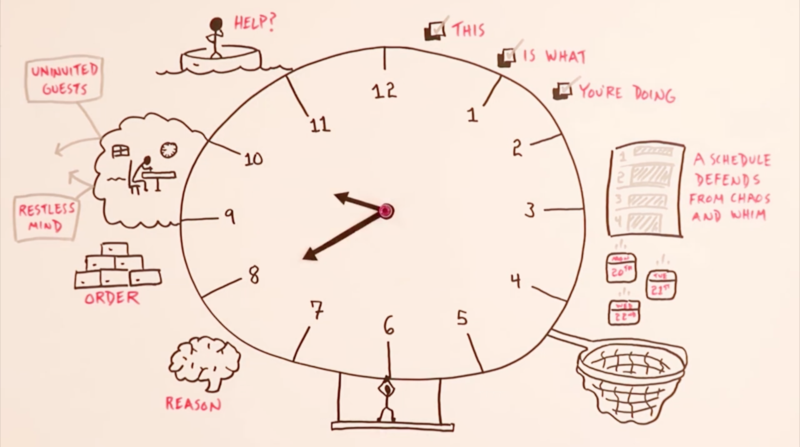 The tension lives in the question around what we choose to do with those hours and those minutes. That’s the story here – that there’s a beginning and middle and end to each day, and how that time is spent is how your life is spent. Let’s look next at a few examples of static sketchnotes. I want to focus on the simple sketched scene in the upper right – a snapshot description of when your current work and your current abilities pale in comparison to your tastes, what you know to be good. The character is once again you. The setting is an imagined one, which connects the three acts as you move left to right. In the beginning you’re stuck on the left side of the chasm, where there’s a big gap between your work and your taste. Act two requires you to do lots and lots of work in order to close that gap so that in act three you can walk across all of that work that you’ve done that has brought its quality up into alignment with what you know to be good. As in our previous examples, note that it doesn’t take a ton of visuals to capture that story. 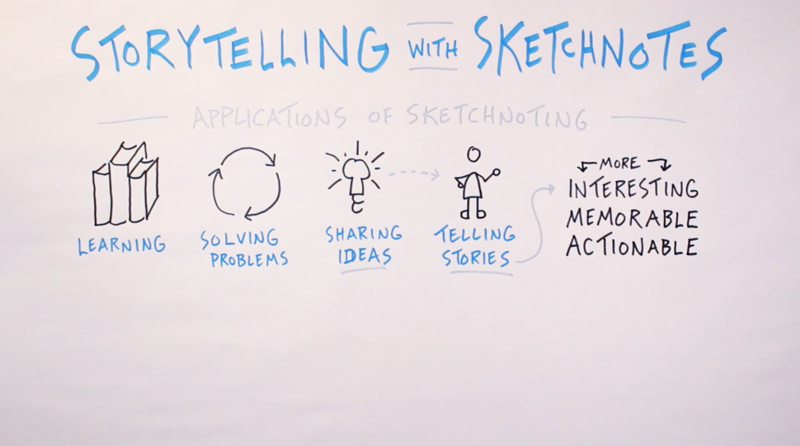 That’s what makes sketchnoting powerful – how a few visuals and a few words can convey a story that has transformative powers. Each scene depicted here is its own little story. You, the creator, are represented by the stick figure. 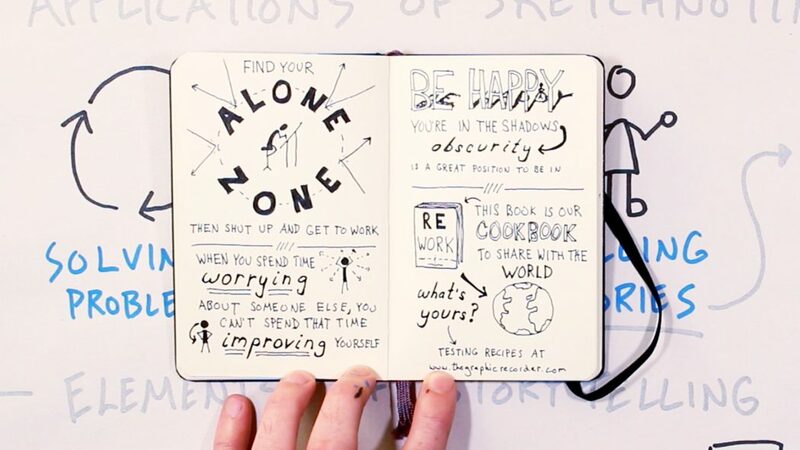 If we focus in on the first sketchnote, the setting is at your desk, you hard at work, in your alone zone, protected against distractions from the outside world. That implies a beginning that’s full of distractions that make it difficult for you to engage in the work that matters to you. The middle, then, is what’s depicted – you at work, having established a time and a space that’s not to be interrupt. I would consider act three to be the end to be the work session, the end of this time in your alone zone, when you open yourself up again to the outside world, with something to show for it – whatever work you got done in act two. My hope is that those examples give you an idea of how you might start using your sketchnotes not just to share ideas, but to tell stories. So try keeping a storytelling lens in mind the next time you are capturing and sharing ideas. Craft those ideas into a story, and sketch out that story for others to benefit from. 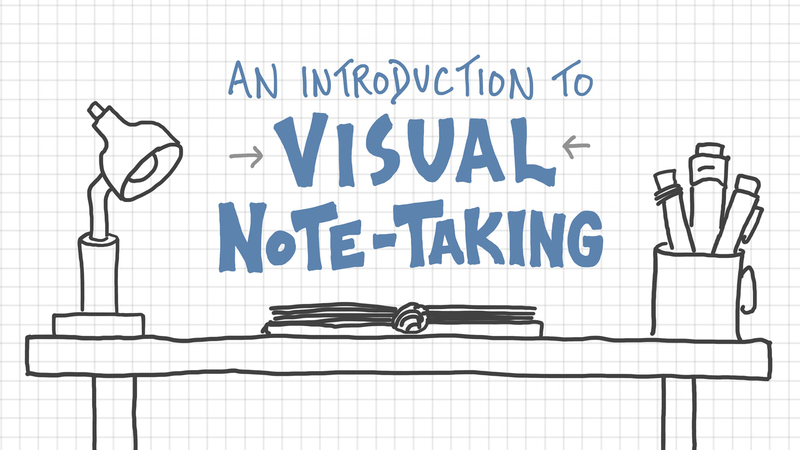 Want more support developing your visual note-taking skills? Check out our library of online courses.